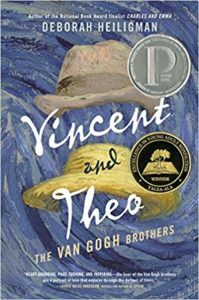 Published April 18th, 2017 by Henry Holt and Co.
Summary: The deep and enduring friendship between Vincent and Theo Van Gogh shaped both brothers’ lives. Confidant, champion, sympathizer, friend, Theo supported Vincent as he struggled to find his path in life. They shared everything, swapping stories of lovers and friends, successes and disappointments, dreams and ambitions. Meticulously researched, drawing on the 658 letters Vincent wrote to Theo during his lifetime, Deborah Heiligman weaves a tale of two lives intertwined and the love of the Van Gogh brothers. 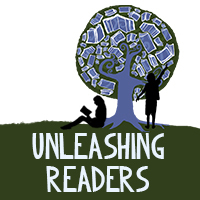 About the Author: Deborah Heiligman has written many books for children, including National Book Award Finalist Charles and Emma: The Darwins’ Leap of Faith and The Boy Who Loved Math. She lives with her family in New York City. Review: I could not stop talking about this book while I was listening to it. That, and that I couldn’t stop listening to the book–I would listen whenever I could, show me what a fabulous book it was. Hieligman does an amazing job making Vincent and Theo’s story come to life through such emotional narrative that the reader cannot help but feel as if we are living alongside the Van Gogh brothers. As someone who loves learning about history and art as well as an interest in brain health, this was a story that was more fascinating than I can even describe. Also, I feel personally connected to this book in a fun way. In November, 2016 Deborah Heiligman and I had a dinner at NCTE, and we got talking about art since she had just finished Vincent and Theo. If you didn’t know, my dad has a BA in Art History and a MFA in Museumology and runs art museums (currently the LSU Museum of Art), so I have grown up around art museums my whole life and with art as a big part of it. One of the things we spoke about is the new information that a painting thought to be a self-portrait (right below) was actually the only known painting of Theo Van Gogh that Vincent painted. One thing that made it hard to determine this was that Theo is wearing the straw hat that Vincent is known to wear while Vincent is wearing Theo’s business felt hat. And this is where Deborah’s question came in: “The hats on the cover matched the hats the men are wearing in the photo although those are not actually their hats. Does it matter?” Now although I love art, I am not the expert, so I offered to ask my dad, and he responded with, “I like the cover as it is. I think it causes a questioning that evidences the new research in an interesting way. It defies previous thoughts and expectations.” Thus the cover stayed as is with an explanation on the jacket (below). But I think what can show you about the book more than just me raving is all of the awards it received, ⇑ see above, and all of the amazing information about how Deborah researched for the book, ⇓ see below, and of course an excerpt from the book, ⇓ also below. Teachers’ Tools for Navigation: View Deborah Hieligman’s research for Vincent and Theo and view all the articles & interviews about the book to use with students when reading this nonfiction text. There is so much that can be done with this story and the author’s writing process; use this amazing text in your classrooms, have it in your libraries, read it yourself–however you see fit, but read and share it! 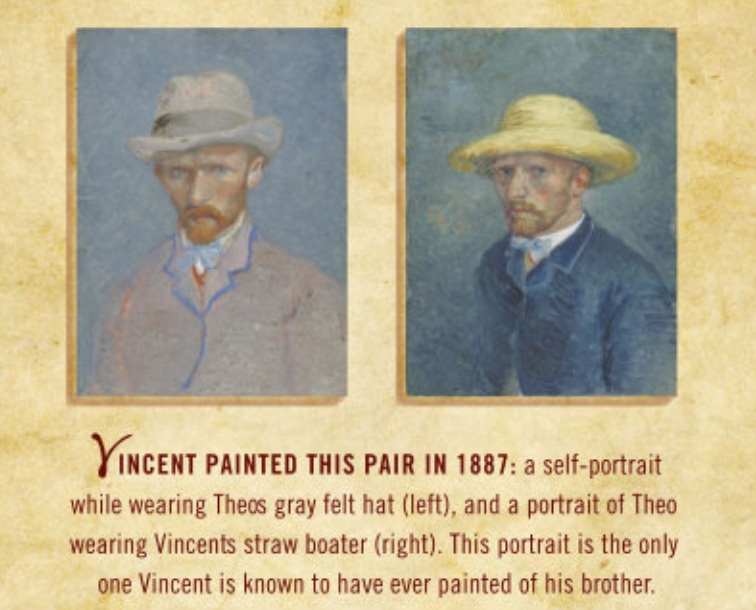 How were Vincent and Theo’s life parallel with each other? In what way were Vincent and Theo’s view of love part of their downfall emotionally? Looking at the two portraits above and after reading the article about the portrait being of Theo, what do you believe? What similarities and differences do you see between the two? How did Deborah Hieligman take all of the letters and research she did and turn them into a narrative? I described this book to my sister as “A love story about two brothers.” Why would I call it a love story? How did Theo’s short but mighty marriage set up for the current popularity of Vincent Van Gogh? Why did it take so long for Vincent to find art? In what way did finding friends in the impressionist art community help Vincent as an artist? THEO’S BROTHER VINCENT has been living with him for just over a year, and Theo cannot take it anymore. It is “almost intolerable for me at home,” he writes to their sister Wil in March 1887. Even though Theo has moved them to a larger apartment, this one still feels too small to hold Vincent’s outsized personality and Theo’s desperate need for quiet. He’s dying to tell Vincent to move out, but he knows if he does, Vincent will just be more determined to stay. Theo van Gogh is the manager of Goupil & Cie, a successful art gallery on the fashionable Boulevard Montmartre in Paris. Theo is good at his job, but it’s terrifically frustrating for him right now. The owners of the gallery want him to sell paintings in the traditional style because they’re popular and bring in money. Though Theo certainly needs to make money—he has to support himself and Vincent and help their mother—he wants to sell art that is truly exciting to him, paintings by the Impressionists and their crowd, friends of his and Vincent’s: Émile Bernard, Paul Gauguin, Claude Monet, and Henri de Toulouse-Lautrec. Soon, maybe even paintings by Vincent himself. But these modern painters don’t bring in enough money, so it’s a constant battle with his bosses. Theo haspersuaded them to let him set up a little display of Impressionists on the entresol. The entresol is not the ground floor, and it’s not the first floor. It’s the floor in between. It’s as if the paintings are there, but not quite yet, a glimpse into the future. It’s a start. But he spends his days working hard and comes back to the apartment at 54 Rue Lepic exasperated and exhausted. What he needs at home is rest and peace, but instead he gets VINCENT. Theo loves his brother’s brilliant mind, his gregariousness, even his fiery temperament. Vincent can be a good antidote to Theo’s own inwardness and tendency to melancholy. But after so many months of the cold Parisian winter spent indoors with Vincent, Theo is a wreck both mentally and physically. A few months back, in December, he was actually paralyzed—he couldn’t move at all for a few days. Although Theo knows he can’t blame his bad health on his brother, to get better he needs a break from Vincent’s gusts, his squalls, his constant talking and lecturing. And, to make matters worse, lately Vincent has been furious at him. “He loses no opportunity to let me see that he despises me and I inspire aversion in him,” Theo tells Wil. A portrait done of the brothers at this time would be sizzling with streaks of red-orange paint. Theo has valiantly been living up to that prayer. He’s been Vincent’s best friend for most of the last fifteen years, ever since they made a pledge to each other on a walk. And through many ups and downs and storms, for the past seven years, Theo has been giving Vincent money for paint, pencils and pens, ink, canvases, paper, clothing, food, and, until he moved in, rent. On March 30 Vincent turns thirty-four; on May 1 Theo will be thirty. They’ve made it this far in their journey together—how can Theo kick him out now? 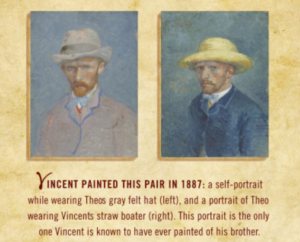 VINCENT AND THEO VAN GOGH look a lot alike: They both have red hair, though Vincent’s is redder, Theo’s more reddish blond. Vincent has freckles; Theo does not. They are both medium height—around five feet seven—but Vincent is broader, bigger; Theo slighter, thinner. They have pale blue eyes that sometimes darken to greenish blue. They are definitely brothers. But they couldn’t give more different impressions. Vincent in his workman’s clothes spends his days painting, outside if it’s not too cold, or inside the apartment. He is covered with Parisian soot and grime, overlaid with splatters and spatters of paint: ochre, brick red, orange, lemon chrome, cobalt blue, green, black, zinc white. He doesn’t bathe often, which is typical for a nineteenth-century man, but it’s even less often than he should. He stinks—of body odor, dirt, food, paint, turpentine, wine, and tobacco. He usually has a pipe in his mouth, though he has very few teeth left, and those that are left are rotten. And yet Vincent looks healthy: he’s robust, sturdy, and vehemently alive. Passion pours from him, as if the world he’s trying to capture is inside him, bursting to come out. Theo is tidy, well dressed in a suit, looking very much the proper Parisian businessman. His features are finer, more refined. He would be handsome if he weren’t so sick: he’s thin and pale; he looks as though the life is being sucked out of him. He feels that way, too. IN MANY WAYS, Vincent’s move to Paris has been good for both brothers. Thanks to Theo’s influence, to the artists he’s met, and to his own tenacious work, Vincent’s paintings are better than ever: they are imbued with color and light and Vincent’s own particular style. And Vincent has given Theo more of a life. He’d been lonely in Paris, so lonely, and now, even though he doesn’t have a wife and family, Theo at least has a circle of friends through Vincent. For that he is grateful. So even though he’s desperate, Theo doesn’t kick out his brother. Yet. In April, Theo acknowledges to another sister, Lies, that he’s been ill, “particularly in my spirit, and have had a great struggle with myself.” If he were well, he could deal with Vincent. In fact both brothers do better with sun and warm air and hours spent outside. The Parisian days are getting longer—by minutes, anyway. If only spring would arrive! But there’s still too much gloom outside and in. It’s as if there are two Vincents, Theo has told Wil. He knows both sides of his brother very well. Sometimes Vincent is ebulliently happy and kind, sometimes furiously angry and difficult. He has a huge heart, but he’s stubborn and argumentative. Vincent argues not only with Theo, and with himself, but also with friends and people he admires. One cold and fiery night in the near future, Vincent will fight with another roommate. And that argument will end in blood.